Vendor Meeting Questions click here. Identification of service gaps in these counties. Service gap areas are places where existing service offerings do not meet the needs the residents, businesses and anchor institutions in the immediate area. Satisfaction levels of businesses and residents with current service. Citizen and business opinion on whether county and municipal government should attempt to assist private sector broadband service providers in offering enhanced and scalable services in the county. As a result, Franklin, Granville and Vance Counties have each issued Requests for Proposal (RFP) to private sector broadband service providers outlining the desire to improve broadband service in their counties. Kerr Tar COG is helping to coordinate this effort across the counties. While each county has issued its own RFP, describing the details of its own situation. Common thoughts on potential incentives and access to facilities the Counties are willing to offer to attract better service. Incentives and access to county and municipal facilities are subject to limitations in State statutes. October 4, 2018 RFP responses due. Bids valid for a minimum of 180 days from deadline date. Broadband is essential to life and economic development in Region K. Just as the State and Federal governments stress its importance. The Council of Governments believes this is important to our rural communities. The Kerr-Tar COG is currently working with Mighty River, LLC to improve Broadband coverage in our Region. See article entitled: Regional Broadband Study Underway in The Daily Dispatch [April 17, 2018]. We will be adding updates to this project on this page. Additional information is available through the Broadband Infrastructure Office. 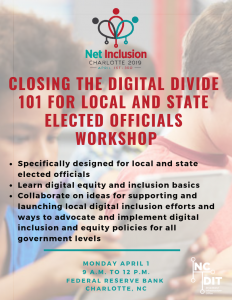 Additional materials to review include: Connecting North Carolina: State Broadband Plan and the Office’s Technical Assistance Brochure. A new resource available is The Community Broadband Planning Playbook. Individual County surveys are available through Survey Monkey below. The feedback provided by residents and businesses is encouraged, as your responses are essential to the success of this project. Thank you in advance for your participation. Vance County has partnered with Kerr-Tar COG to coordinate the implementation of a regional broadband plan. The purpose of the business broadband survey is to learn the current extent and need of internet/broadband service in the Henderson-Vance County business community. Also, the survey responses will help in determining opportunities for attracting faster internet/broadband service. The business broadband survey only consists of 15 questions, and can be completed in less than four minutes. Results of the survey will be confidential. Working with RiverStreet Networks to improve Broadband Services in the county.